In June of 2012, at the age of 23, Quebec writer Vickie Gendreau was diagnosed with a terminal brain tumour. 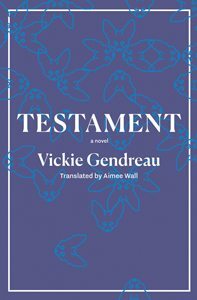 Her response was to write through the comingled grief, anger, confusion, and frustration that accompanied the news; Gendreau opted to do this not by way of a conventional memoir, but by fictionalizing her experience. Published in French by Le Quartanier in September 2012 (Gendreau died in May 2013), Testament became a sensation, in part due to its subject matter, but also as a result of its structure and approach: the author employs a fragmented style and a polyphonic narrative, flipping from a semi-autobiographical stance (told from the point of view of a character named “Vickie”) to imagined versions of her friends and family, who react to her death and to snippets of posthumous writing she has bequeathed them. The highly self-referential narrative approach, combined with the impulse toward unfiltered self-disclosure (Gendreau also writes about her time as an exotic dancer, at one point imagining her mother’s reaction to seeing her dance), help locate Gendreau squarely in the YouTube demographic, a status she does not disavow: “She was so trashy, so sparkly, so explosive, so much of her generation.” But any critique of a vaguely defined (and, under the circumstances, frankly deserved) self-regard belies the authentic emotion that infuses the novel’s final pages, which are tinged with the inescapable metafictional recognition of an author staring down the knowledge of her own impending demise. In addition to confronting her own imminent mortality, Gendreau takes determined ownership of her legacy. War is Delvaux’s abiding metaphor: she fills her narrative – which takes the form of a final letter from a disillusioned and embittered woman to the man she has left after two years together – with images of Roman gladiators, St. Sebastian shot through with arrows, Julius Caesar’s march on Rome (and inevitable assassination), and, of course, the titular bullet, which is the text itself, and is explicitly meant to pierce the man to whom it is addressed. Asked how she ideally conceives of herself, the narrator suggests something between Joan of Arc and “a female Dirty Harry”: that is, between a warrior leader and a violent avenger. Martial imagery pervades the novel, implying that the pages represent a battlefield. But it is a patently one-sided battle: we are presented with only one voice in the novel, only one perspective from which to judge the events that have led to the declaration of war. The other party is a cipher, a literal non-entity reduced to the status of cartoon monster (the narrator compares him at one point to Hannibal Lecter). 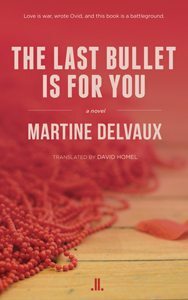 In this way, The Last Bullet Is for You stands as a rebuke to such male-centric relationship novels as Philip Roth’s My Life as a Man, and operates as an act of anti-romantic wish-fulfilment. It also reproaches those readers who insist that a female protagonist should not appear angry or rancorous. The narrator’s vituperative j’accuse is a feminist act of erasure; the battle it describes is never joined.